(L-R): Margaret Nolan, Peter Love, Isobel Horan, Laura Cullen and Catherine Connolly Top: Mark McKernan, Kevin Leonard, Ollie Conway, John Carrigan, Johnny Hanrahan, John Behan and Patrick Kiersey. On Friday 28th of August on a sunny evening in the Pembroke Wanderer’s Hockey Club on Serpentine Avenue, teams from across the property and construction sectors gathered to play for the YSCSI tournament cup. A festival atmosphere prevailed with both teams and many supporters playing to a lovely music beat. With a doubling of numbers from 2014 to twenty team entries, the competition was high but AECOM, DTZ Sherry Fitzgerald, Logical and WK Nowlan maintained their energy to play out to the quarter finals. The final saw AECOM and DTZ Sherry Fitzgerald go head to head, with DTZ Sherry Fitzgerald taking the winning cup. 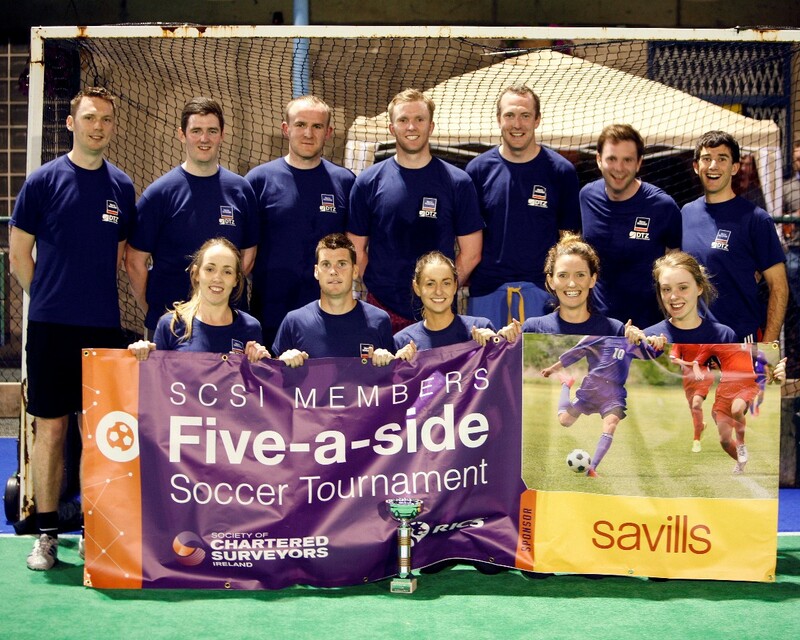 Uncle Sam’s Smokehouse provided well deserved replenishments as the event closed with the winning cup being presented by Savills to DTZ Sherry Fitzgerald. Our thanks to Savills whose support in sponsoring this event, is valued.